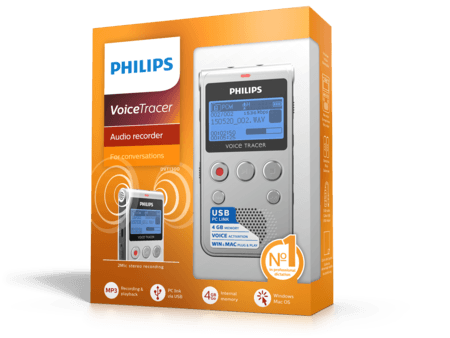 The VoiceTracer 1300 is the perfect audio recorder for capturing conversations while you are on the go. Thanks to MP3 stereo recording you get always great audio quality which you can easily share with others. Two sensitive stereo microphones capture your notes and conversations in digital quality. The popular MP3 format allows you to play back your recordings virtually anywhere and easily share them with others. The innovative Noise Cut feature automatically filters out disturbing surround sounds such as wind or traffic, enabling clear recordings, even in noisy environments. The integrated recording stand allows you to prop up your digital recorder, enabling even better sound quality pick-up. The large speaker enables clear audio playback. High sound quality ensure recordings are understood at first listen and do not need to be re-played. The line-in jack enables users to attach external devices such as additional microphones, for even better sound quality.